If you have ever been on a hike and got a blister, and been way out there with no recourse but to keep hiking, you will appreciate what it must be like for the horse in distress from a badly fitting saddle. I read that during the Napoleonic Wars, the French cavalry could be smelled by the enemy forces from the stench of the wounds on the horses’ backs. How disgusting is that? Get a saddle that fits, and get a girth that doesn’t rub, and get clean, soft, absorbent saddle pads, and make darn good and sure that your saddle isn’t making your horse uncomfortable when you ride him Horses’ backs come in all shapes and sizes, and there is no such thing as a “one size fits all” saddle, no matter how many saddle pads you use to concoct a fit. It’s easy to get suckered into thinking that saddle suitability and saddle price are closely linked, and sometimes an expensive custom saddle will make you and your horse feel as if you have gone to heaven, but there are thousands of saddles out there, and if you shop and shop you can find one within your budget that will make you smile. The key is to not just settle for “sort of okay.” If you don’t really like how the saddle feels, or if the saddle seems not to be a good fit for your horse, keep looking. There are so many styles and varieties that somewhere the right one is waiting, but you will need to hunt. I think it’s worth the search, though, if you can’t spring for the custom-made saddle that costs more than a good used car. I have taught clinics where I’ve sat in 10 or 15 saddles over the course of the clinic, and in some I felt as though I could ride, and in some I felt as awkward as a rank beginner. Saddle fit absolutely can help or hinder you, and not just a little bit, but a whole lot. Get the right saddle. If you take good care of it, and it doesn’t get stolen, you can keep it for decades. So keep hunting until you get it right. But, just because it’s right for you does not mean, as I said earlier, that it will be the right fit for the comfort of the horse. 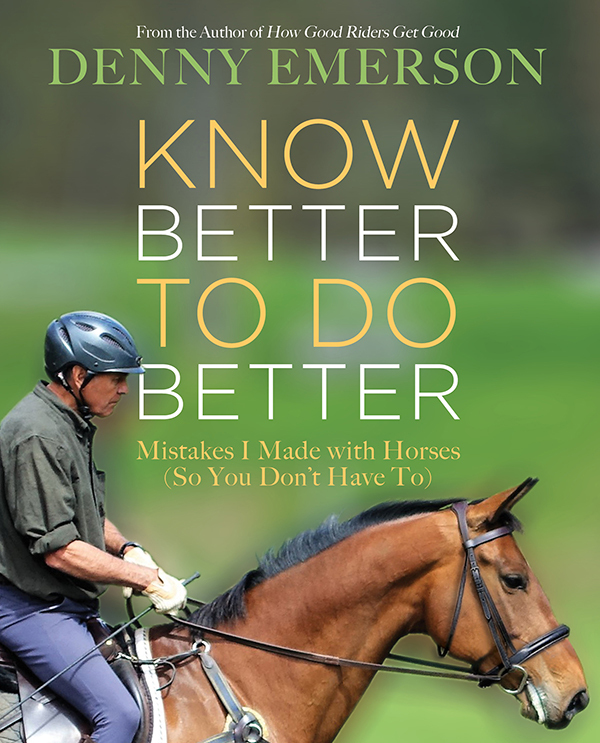 In Know Better to Do Better, author Denny Emerson details some of the things he wishes he’d known “then” that he knows now.